You've got the talent and the time to become successful as a writer, but you don't know where to start. Convert Your Words to Cash gives you the answer to that question. Best of all it's FREE. That's right this 8,000 word, 28 page ebook tells you everything you need to know to make money online writing and it's FREE. Won't cost you a penny. Just enter your name and email below. Once you've confirmed your subscription you'll get a message with the download link. 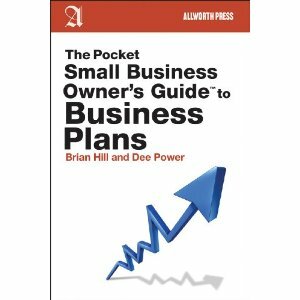 Brian Hill and Dee Power's latest book, The Pocket Small Business Owner's Guide to Business Plans shows you how to create a business plan from start to finish. Order your copy now. Inside Secrets to Venture Capital The inside story on finding the venture capital your business needs to grow. If you've ever asked yourself how you can improve your writing business, you've come to the right place to find the answers. Who are we? We're the writing team of Hill and Power. Sign up for our free newsletter "Words for Readers and Writers" We'll be announcing our new books, publishing industry news, interviews with bestselling authors and our upcoming new products, guides and videos just for writers and authors. While you're here, grab your favorite beverage and poke around our site for a bit. You sit down in front of your laptop. Pull up a file and the phone rings, you check email, your Facebook status, answer a few private messages and suddenly it's late afternoon. Or maybe you bunny hop the day. Working on this project for an hour then hopping to that project for an hour but not crossing the finish line for any project. Do you know what kind of writing you want to do? When will you consider yourself a success? What should you focus on first? If you haven't figured out where you want to go as a writer, you'll never get there. 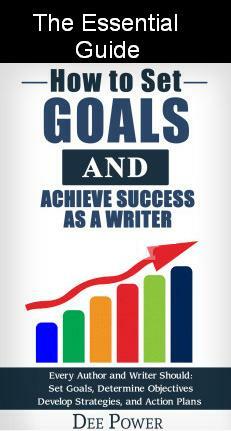 The Essential Guide: How to Set Goals and Objectives and Achieve Success as a Writer was written just for you. Find out more. 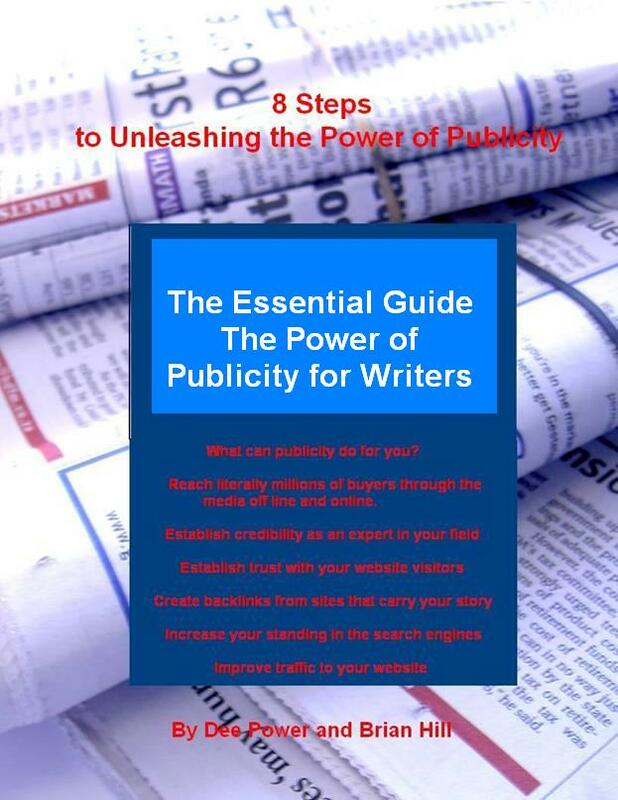 What Can Publicity Do For You? The Essential Guide for Authors and Writers: 28 Day Action Plan Make Money Online Whether you've written a nonfiction book, a novel, or a short report, this guide shows you the way to making money. It doesn't matter whether your book is commercially published or self-published. Day by day for 28 days you'll know exactly what to do. Find out more. What's our Newest Project? Adventures of Brian and Dee We've sold everything we own, -- well almost everything and we're traveling around the United States, still writing of course. Follow our journey. Rose the Irish Setter and Kate the English Springer Spaniel, best friends for more than a decade, discovered several years ago that they had an amazing talent: they can blog. 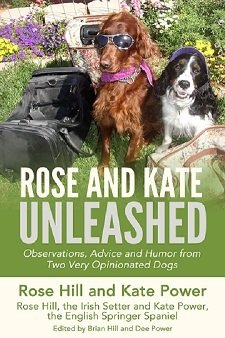 Since then, they have been writing down their observations, experiences and fun times and now they are ready to share them with you in their brand new Ebook, Rose and Kate Unleashed" Edited by Brian Hill and Dee Power. 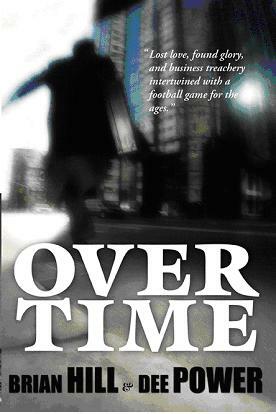 Over Time $14.95, ISBN 0974075416. A story of lost loves, found glory, and business treachery. Time is running out for Dan to save the business that took his family sixty years to build. Kelly's lifework crumbles around her. Mike thinks he'll always be the guy watching the world from the sidelines. Mark dies just when his dream of playing football for the Green Bay Packers seemed within reach. Then a letter lost for twenty years arrives and sends the game of life into overtime. It all comes down to a desperate financial gamble, a football game for the ages, and the emotional reunion of four friends who could not be separated by time, distance or even death. All this "team" needed was a little more time than reality normally grants us. More about Over Time . We earn our living as writers and have for quite a while now. You can find out more about our published books, Dee's biography and Brian's background. Blogs ... well I think you get the idea. So relax. Get yourself your favorite beverage and poke around our website. Oh, and we'll be holding a few online seminars over the next few months. You can find out more by scrolling down and signing up for our newsletter. Follow our progress in the publication process from coming up with the idea, outline, finding a literary agent, publisher, working with the publicity department, completing the chapters all the way through seeing our new book on the shelves. We'll also share what we're working on now with our screenplays and nonfiction works. Successful authors write on a variety of topics including how to, self help, business and Summa Metaphysica as well as fiction of course. If you buy something from this site we may get paid a commission. We also on occasion receive free samples in exchange for a review. Those reviews are objective and not influenced by the fact we may have received free merchandise.